Ian is a Professor in the HRM division within the Business School. He works with colleagues in the HRM division and those based across the Business School to further raise the scale and scope of the scholarly, research, impact and engagement trajectories of the School. 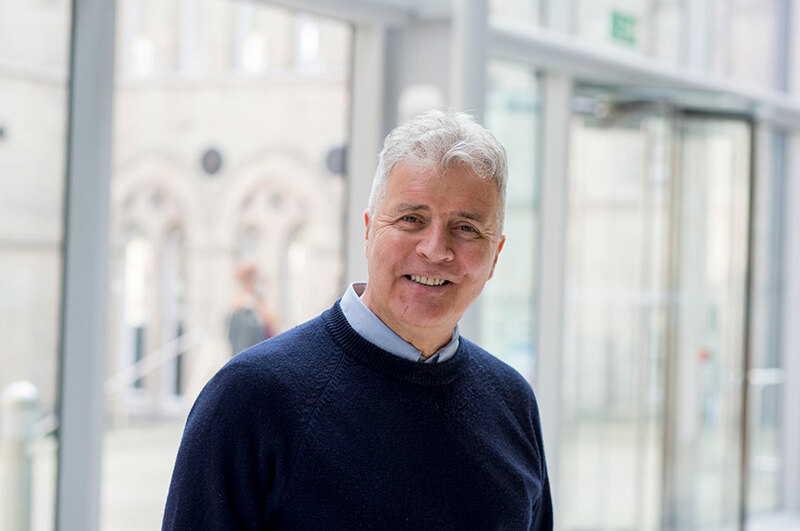 Ian previously worked at Birmingham Business School and at the Centre for Sustainable Work and Employment Futures (CSWEF) at the University of Leicester. At Birmingham Ian was part of the teams which secured CIPD accreditation for the MSc HRM programme and EQUIS accreditation and re-accreditation and led the organisation, work and employment group. At Leicester Ian helped establish and roll-out CSWEF where he oversaw its research and administrative staff as well as working on research projects established in the centre and supervised two doctoral students located in the centre. Ian was the founding convenor of the work and employment division which he led between 2013 and 2016. The organisational and HR implications of sustainability and transformation plans in the NHS. The implications of businesses which use informal business and employment practices. The diffusion of new business models associated with private equity and hedge funds and the organization and work implications arising from these models. Financialisation and the diffusion of shareholder capitalism. The impact of skill-mix strategies in the NHS on the work of health care assistants. Please visit the NTU Doctoral School website for information on doctoral research opportunities at NBS. Ian edits Work, Employment and Society, an ABS 4* ranked world-leading Journal and is an academic fellow of the Chartered Institute of Personnel and Development. Between 2007 and 2010 Ian was a member of the Treasury Select Committee on Private Equity and subsequently provided expert advice to the government, trade unions and employers. More recently he was invited to provide formal oral and written evidence to the Department of Work and Pensions inquiry into the collapse of British Home Stores and more recently still has presented evidence to the Watson independent Commission on the future of work and the Taylor review (commissioned by the current government) on modern employment practices and will be part of the British Academy meeting on the review in October. In both forums Ian reported on the threat posed to legitimate businesses, large and small, by businesses which utilise informal business and employment practices, for example those in small unit garment manufacturing and hand car washes. Ian has collaborated and published with Eileen Appelbaum (Centre for Economic Policy Research Washington DC) and Rose Batt (Cornell) on private equity buy-outs and Michel Goyer (Birmingham) and Shabneez Bhankalarually (Manchester) on the comparative application of new business models. He is currently collaborating with the GLAA (Gangmasters Labour Abuse Authority) and presented at a workshop they recently commissioned and convened. Ian currently collaborates with Dr. Jo Grady, (University of Sheffield) on the financialisation of pension schemes at British Coal, Tata/British Steel and BHS and is working with Edward Yates (CSWEF, Leicester) on the governance of local labour markets by government and associated agencies and the implications of this for skill formation in young workers. His work has been supported by the ESRC, the UK Treasury, the ETUC, the GMB union, the Ethical Trading Association and the Anglo-German Foundation. Goyer, M., Clark, I., Bankaraully, S. (2016) ‘A Qualitative Analysis of Downsizing in France and the United Kingdom 2008-2013’ Human Resource Management Journal, 26:3 252-268. Read the whole article here. Beck, V., Brook, P., Carter, R., Clark, I. Danford, A. Hammer, N., Kanji, S., Simms, M. (2016) Editorial: Work, Employment and Society – sans frontiers: extending and deepening our reach. Work, Employment and Society, 30:2 211-219. Clark, I. and Thompson, A. (2015) ‘Health Care Assistants; Distributional Losses as a Consequence of NHS Modernization’? New Technology Work and Employment, 30:3 209-221. Clark, I. (2014) Health Care Assistants, Aspiration, Frustration and Job Satisfaction in the Workplace, the Industrial Relations Journal, 45:4, 300-312. Clark, I. (2017) ‘Financialization and its implications for work and employment’ presented at the ETUI workshop, The University of Sheffield, June 21st. Clark, I. (2016) presentation of written and oral evidence to the Rt. Hon. Frank Field, Chair, Work and Pensions Committee, on the collapse of the BHS pension scheme, reporting to Adam Mellows-Facer, Committee Clerk, workpencom@parliament.uk. Clark, I. and Colling, T. (2016) ‘Regulatory Reach in Britain’s Informal Economy: Road Side Hand Car Washes in Leicester’. ESRC Seminar on Labour Market Regulation in the Post-Crisis Era, University of Sheffield, May 5th. Clark, I. (2018) ‘The Political Economy of Finance-Led Capitalism: Connecting Financialization, Private Equity and Employment Outcomes’ in Wright, M., Amess, K., Bacon, N., Siegel, D. (eds) The Routledge Companion to Management Buyouts – Routledge Companions in Business, Management and Accounting. London, Routledge, September 2018. Clark, I. (2017) ‘Comparative HRM in the context of Financialization, financialization and Brexit’ in Beardwell, J. and Thompson, A. (Eds) Human Resource Management: A Contemporary Approach. Pearson Education, London. 8th Edition, October. Great Recession and its Aftermath’ in The Comparative Political Economy of Work and Employment Relations, Haupemeier, M. and Vidal, M. London, Palgrave Macmillan Labour Process Book Series. April. Appelbaum, E. Batt, R., Clark, I. (2013) ‘Implications for Employment Relations Research: Evidence from Breach of Trust and Implicit Contracts in Private Equity Buy-Outs’ British Journal of Industrial Relations. 51:3 498-518. Clark, I. (2013) ‘Templates for Financial Control’ Management and Employee Interests under Private Equity’ Human Resource Management Journal. Vol.23:2 144-159. Heyes, J. Lewis, P. Clark, I. (2012) ‘Varieties of Capitalism: The State, Financialisation and the Economic Crisis of 2007-?’ Industrial Relations Journal 43(3) 222-241 May. Bailey, D., Clark, I. De Ruyter, A. (2010) ‘Private Equity and the Flight of the Phoenix Four – the Collapse of MG Rover’ The Cambridge Journal of Regions, Economy and Society, Volume 3(3), 1-15. Clark, I. (2009b) ‘Private Equity in the UK: Job Regulation and Trade Unions’ Journal of Industrial Relations. 51(4) 491-502. Clark, I. (2009c) ‘Owners not Managers: Disconnecting Managerial Capitalism? Understanding the Take Private Equity Business Model.’ Work, Employment and Society 23(4), 359-378. Clark, I. (2007) ‘Private Equity and HRM in the British Business System’ Human Resource Management Journal 17(3) 218-226. Clark, I. (2006) ‘Another Third Way:?, VW and Trials of Stakeholder Capitalism’ Industrial Relations Journal 37(6) 593-607. Clark, I., Almond, P., Gunnigle, P., Wachter, H. (2005) ‘Americanization in the European Business System’ Industrial Relations Journal 36(6) December, pages 494-517. Edwards, T., Almond, P., Clark, I., Colling, T. and Ferner, A. (2005). ‘Reverse Diffusion in US Multinationals: Barriers from the American Business System’ Journal of Management Studies 42(6) pages 1261-1268. Clark, I. and Colling, T. (2005) ‘The Management of Human Resources in Project-Led Organizations’ Personnel Review Volume 34(2) 178-191. Clark, I. and Almond, P. (2004) ‘Dynamism and Embeddedness: Towards a Lower Road? : British Subsidiaries of American Multinationals and the British Business System Industrial Relations Journal Volume 35(5) pages 536-556. Almond, P., Edwards, T. Clark, I. (2003) ‘Multinationals and Changing National Business Systems in Europe: Towards the “Shareholder Value” Model’? Industrial Relations Journal Volume 34 (5), Pages 430-446. Clark, I., Colling, T., Almond, P., Peters, R., Gunnigle, P., Morley, M., Portillo, M. (2002) ‘Multinationals in Europe 2001-2002: Home Country, Host Country and Sector Effects in the Context of Crisis’ Industrial Relations Journal Volume 33(5) pages 445-463. Colling, T. and Clark, I. (2002) ‘ “Looking for Americanness”: Sector Effects in Engineering Process Plant Contracting’ European Journal of Industrial Relations Volume 8(3) pages 301-325. Clark, I. (2001) ‘Strategic HRM as a Budgetary Control Mechanism in the Large Corporation: A Case Study from Engineering Contracting. Critical Perspectives on Accounting. December Volume 12 797-815 pages. Clark, I. (1998a) ‘Designing and Sustaining an Entrepreneurial Role for the Human Resource Function’. The International Journal of Entrepreneurial Behaviour and Research Volume 4(2). Clark, I. (1994) ‘HRM: The Reinvention of Modern Management?’ Personnel Review Volume 23(5) pages 17-25. Clark, I. (1993) ‘HRM: Prescription, Description and Concept’ Personnel Review Volume 22(4) pages 17-26.